A music themed trio of speakers at Nerd Night revealed the positive ways music can change our lives this month. For the non-nerdy, Nerd Nights are like TED talks, but with more fun, beer and cake. Working with agencies that help retailers to use music to improve the shopper experience, we’re all too aware of the way that the soundtrack to an activity can change a mood. Even in our office in the North Laine, we use music to help us work more effectively. 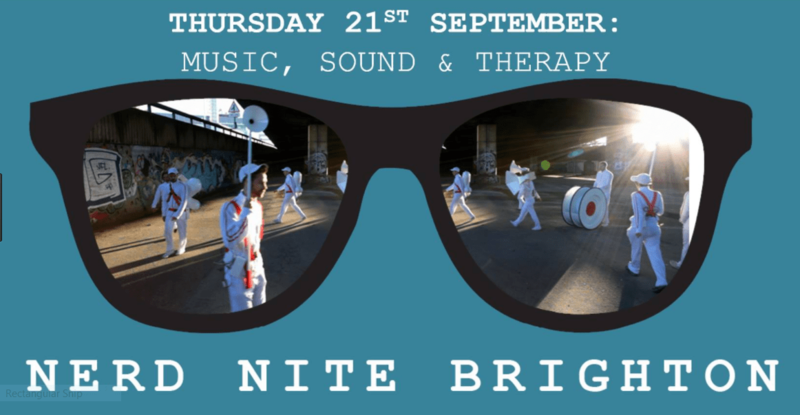 So, it was fascinating to hear other ways that music can change a mood and even transform lives at Nerd Night. First up was Emily MacDonald, a music therapist who explained why singing was good for you. Singing also releases serotonin, oxytocin and dopamine, all those feel good chemicals which help to make us happy. It also lowers cortisol – the chemical that signals levels of stress. Emily’s music therapy, founded in neuroscientific principles, has helped vulnerable and at-risk children to find joy in their lives, give them a release from their problems and helped them to make friends. She has also lead therapeutic singing groups for adults with dementia, where she explained elderly people, usually unable to communicate, would suddenly light up when they heard Bring Me Sunshine or We’ll Meet Again and start singing along. Put very simply, music switches on areas in our brains which are not linked to speech, so it enables dementia sufferers to sing and speak. There are some moving videos of the transformative effect music can have on dementia sufferers on YouTube. Our next speaker Dr Chris Kiefer revealed the cutting-edge world of designing new musical instruments. He’s a computer-musician who performs with custom-made instruments including malleable foam interfaces, touch screen software, interactive sculptures and a modified self-resonating cello. He shed light on the Stanford Laptop Orchestra who play music on laptops with individual speakers attached to each computer. The challenge, he explained, is how to make the experience of playing a laptop more enjoyable for the user – pushing a button doesn’t engage with the player in the same way that a bow or striking piano keys does. It needs to be challenging enough to make us want to keep playing, but accessible enough so that we don’t give up trying to play it immediately. For example, Chris said, you can turn a table into a musical instrument by hitting it, but it probably won’t entertain you for very long. And it won’t make you any friends. Lastly artist, designer and portable sound system designer Ben Newland took to the stage to show us how people use sound to occupy spaces around the world. From Occupy Wall Street to reclaiming the streets at the Notting Hill Carnival, people have been using sound systems to show ownership of a place for decades. Anyone who has seen the Brighton Naked Bike Ride or taken the Brighton Bike Train will have seen one of Ben’s sound systems at work. 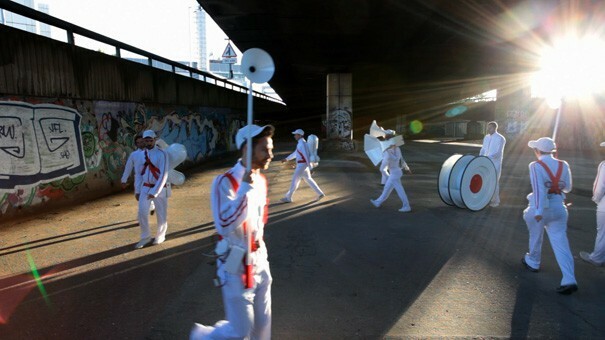 He is also the creator of Nomadic Sound Systems, a ten-piece portable sound system in the form of a marching band. He explained that the music that accompanies the bike ride made it possible for cyclists to feel comfortable riding naked as they protested about environmental issues and road safety. Whether it’s teenagers ‘sodcasting’ on the back of a bus, or demonstrators making a point at a political rally, portable sound systems enable listeners to disrupt the status quo, lay claim to territory, or project their cultural values. If you haven’t made it along to Brighton Nerd Night, or indeed to a Nerd Night in another city (they’re all over the world!) we suggest you try it. Beer, cake and learning new things? What’s not to love?